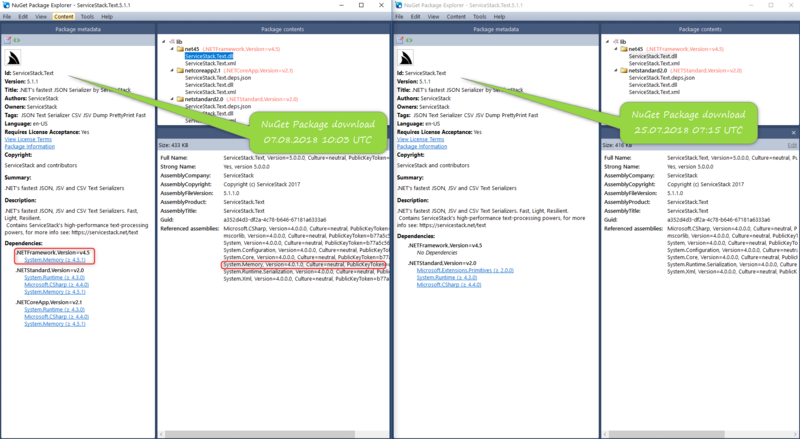 but it won't be resolved during the build, to solve the issue we need to add the package System.Memory 4.5.1 explicitely to the project NuGet dependencies? As you can see, System.Memory is a NuGet package dependency of ServiceStack.Text. But if you had v5.1.1 installed before the dependency was added you would need to uninstall/re install the ServiceStack.Text package. Ok thanks, but how is it possible to publish the same NuGet package version twice? There is only ever 1 version of the pre-released packages published on MyGet, the latest. The existing packages are deleted before the latest are published.